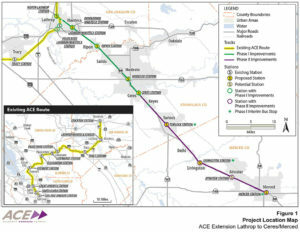 ACE is planning for an extension of the line from Lathrop eastward to Modesto and Merced. Initial funding for the extension has been approved under the SB1 fuel tax program in 2017. Extension would operate on the UP corridor adjacent to SR-99, rather than the BNSF corridor used by the San Joaquins. Due to the limitation on commuter train traffic in the Niles Canyon, some trains that current start and end in Stockton would be diverted to start/end in Modesto or Merced. For other trains, passengers would transfer at a new station near the track junction. The train schedules would be coordinated to facilitate transfers. Trains to/from San Jose would have additional cars to accommodate the transfers. Merced is the planned terminus in the northern Central Valley for the California High Speed Rail system.